My camp last night was great, I watched Jupiter and Orion twirl about the dark sky during the couple of times I had to answer nature's call. This is a good thing, it means I'm drinking enough water. At 4:20am, though, a pair of heavy planes flew overhead and decelerated rapidly. I waited for the sound of some crash that never came, then realized it's that same pair of FedEx/DHL/UPS air cargo planes landing in San Diego at 4:30am... those same planes that wake me up from time to time in my bed at home as they apply their thrust reversers. I'm not so far away after all, and though I was tired I couldn't sleep anymore. And like every day so far, a new body part was demanding attention. Today it was oddly my right quadricep, it was stiff and I couldn't really bend my knee at all. What the hell? It was just more awkward than painful; I tried to stretch it but it didn't help. Maybe the trail will work out the kinks. And the trail... well, yeah, the first few miles were spectacular yet annoying. The track hugged the edge of the escarpment to the desert some 5000 feet below, and the air was wonderfully clear; I could pick out the shoreline of the Salton Sea far to the east, and San Jacinto and Toro peaks to the north. Now the annoying part--it was pretty windy, and the trail would go up, and down, then up again. Come on, I know eventually the trail heads to the desert floor--I was cursing "REALLY?!??" at all the little uphill bits, knowing they'd all be given up. There were lots of bush poppies along the section, which livened things up! And yeah, the PCT took a radical turn--dropping steeply to the east into Chariot Canyon around mile 63. No gentle track here... this was a mile or so of quad blasting downhill, and I was really thankful I brought trekking poles as that right quad didn't want to really behave. Then at the bottom, a few nice campsites on grassy creekbeds, and boom, a super steep uphill on a four-wheel-drive road. Again: WTF? That uphill was hot, so I pulled out the umbrella and took off my hat and shirt. And then the PCT split away, and followed a gentle contour for several miles to the Rodriguez water tank. 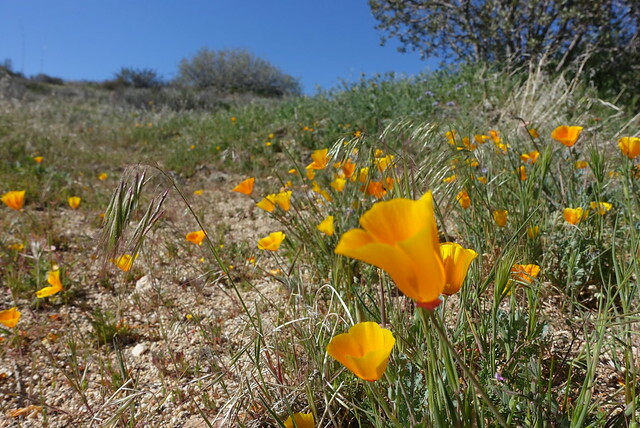 That was great hiking, with lots of wildflowers and I got in a nice zone. I realized that it was both the umbrella and trekking poles that made that section so comfortable--though it was in the low 80's, there was a cooling breeze, and everything above my waist was shaded by that big shiny umbrella. A win. I filtered 3 liters of water for the remaining 9 miles to Scissors crossing--enough for hiking and camping overnight, then motored on. Around mile 71 I heard a woman say "Hey, over here!" and thought I was dreaming. I hadn't seen anoyone else all day except for one day hiker at the very beginning. She introduced herself as Beerdra, and invited me over to sit in the shade of her tent. We chatted a bit; she was looking forward to a zero day in Julian tomorrow, and said "man, this trail is tough". She's done the Appalacian Trail, and said this is nothing like that. The heat was a shocker for her--she left Boston about a week ago and it was 10 degrees. Yep, this isn't Boston, but there are wildflowers. We talked a bit about plants, and found that both of us got motivated to press on when we saw a pink beavertail cactus blossom a few hundred meters behind us. But I needed to be at Scissors Crossing at 8am for my ride to Julian, so I said my goodbyes and pushed on. 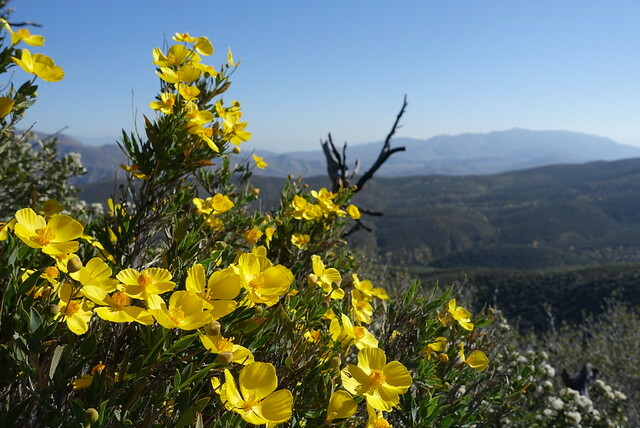 The plants changed dramatically from mile 71 to 72--from scrubby chaparral with a few desert plats mixed in to all sorts of different new cactus species, large agaves, juniper, even a pinyon pine. Definitely in the desert now. 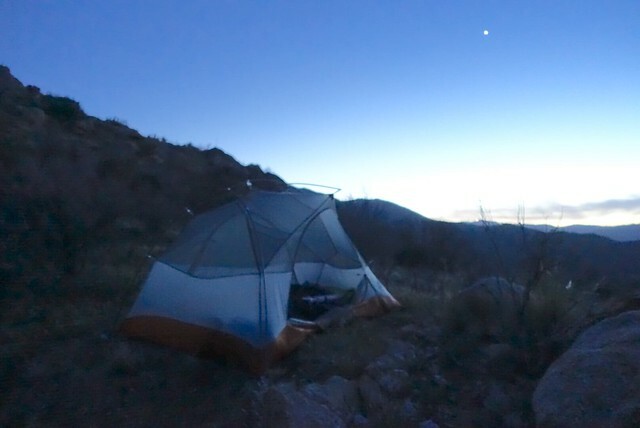 And, like most nights so far, I found a tentsite right at dusk, and I camped at mile 73.4. The site not the well-known one, which was occupied by another tent with someone snoring a bit, but up the hill was a spot just big enough for my Big Agnes Copper Spur 2. I didn't want to hassle with cooking, so I chowed on a Clif Bar, mixed nuts, edamame, and sausage. Gourmet dinner, yeah, but I'm looknig forward to restaurant food and PIE in Julian tomorrow morning... before I do the 14 hot miles to 3rd Gate Cache. A garter snake, and a super cute baby horny toad. Low 37. High 88. Sunny and breezy!